Prior to the shooting, the victims attended a gathering at Shattuck Picnic Grove in Franklin Park. Photos show at least 100 people were at the gathering. Police are interested in speaking to anyone who may have been there and/or may have spoken to the victims. Boston Police homicide detectives are also asking the public to help identify the owner/operator of the vehicle that was in the area of the shooting. 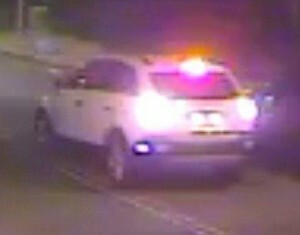 The SUV appears to be a newer model white Saturn Vue or Chevrolet Captiva. It is the one year anniversary of this homicide. Boston Police are actively investigating this incident and asking the public’s assistance in any information persons may have regarding these photos. At about 9:22pm, on Sunday, August 12, 2012, officers from District B-3 (Mattapan) responded to an outside scene for a person or persons shot in the area of 36 Harlem Street. On arrival, officers located four female victims suffering from what appeared to be gunshot wounds. Two of the victims were pronounced deceased on the scene. A third victim, who was transported from the scene with life threatening injuries, has since died. The deceased victims are identified as Genevieve Phillip, 22, of Milton, Kristen Lartey, 22, of Hyde Park and Sharrice Perkins, 22, of Dorchester. A fourth victim, sustained a gunshot wound to the leg, was transported from the scene with non-life threatening injuries. The Boston Police Homicide Unit is actively investigating the facts and circumstances surrounding this incident. Anyone with information is encouraged to call the Homicide Unit at (617) 343-4470. Individuals wishing to assist this investigation in anonymous manner can either call the CrimeStoppers Tip Line at 1(800) 494-8477 or text the word ‘TIP’ to CRIME (27463). The Boston Police Department will stringently guard and protect the identities of those who wish to help this investigation in an anonymous capacity.